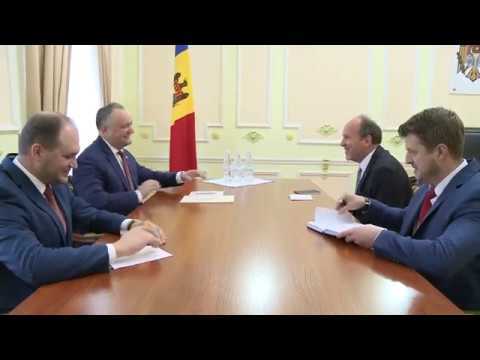 President Igor Dodon has met Ambassador of Romania to Moldova Daniel Ionita. The head of state also had several friendly and productive discussions on the need for a balanced and mutually beneficial cooperation between our states both in economic and cultural sectors. Dodon assured the ambassador of the fact that the Moldovan-Romanian relations are and will remain fundamental for Moldova, by virtue of our neighborhood, the common historical events and cultural affinities we have always had. “We are two independent and sovereign states that have to find new opportunities for cooperation beneficial for citizens”, he said. He added that an important topic for today’s meeting was his desire to hand over to Mr. Ambassador Daniel Ionita an official letter addressed to President of Romania Mr. Klaus Iohannis. “By this letter, I sent Mr. President Iohannis my invitation to visit Moldova. I believe that a responsible and constructive communication needs to be set between the heads of state of Romania and Moldova. I strongly believe that only through repeated discussions the asperities and difficulties that arise in the relations between states or institutions can be overcome, and I am counting on the fact that the president of Romania is open to accept a dialogue in Chisinau in any convenient time for him”, Dodon concluded.